Batte cast film die design Die effective width of up to 8000mm, manually adjust the flexible lip, single-channel, multi-channel coextrusion compound cast film die, the characteristics of the corresponding extruder can be designed for the following applications PP.PE.EVA casting Membrane, CPP.CPE.PVDC, EAA barrier film with EVH and PA, commonly used in food packaging, a variety of specifications, types of stationery film, sanitary products film, adhesive film, plastic wrap, etc. 1. The die has a streamlined runner surface, two half-mold design, die disintegration, cleaning is simple and easy. 2. Manual trimming of elastic lip or movable lip design to suit different thickness requirements of extruded sheet. 3. Vertical or inclined 45 ° baffle designed to accommodate uniform distribution of melt streams of different viscosities. 4. mold using high-quality mold steel or imported alloy steel, to extend the life of the mold. 5.The flow channel surface all hard chrome plating, the average thickness of 25μm ~ 50μm, and mirror polishing. 6. die fasteners using 12.9 high strength bolts. 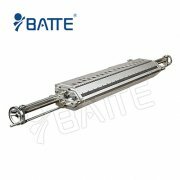 7.heating element using high-quality, durable stainless steel heating rods, heating ring. Galvanization the stream surface of the die head are treated by chrome treatment. Thickness 0.03-0.04(μm),hardness: 60-65Rockwellc,the chrome treatment thickness of the ektexine is 0.01-0.02mm.